Place potatoes in a large pot. Cover with water and bring to a boil; cover and simmer for 15 to 20 minutes until tender. Meanwhile, simmer the scallions gently in the milk for 2 to 3 minutes. Drain the potatoes; return them to the pot and place over low heat for a minute or so to allow excess water to evaporate. 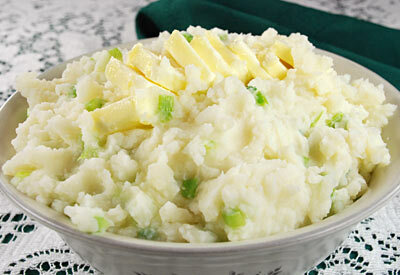 Add the milk and onions and mash the potatoes until soft and fluffy. Add salt and pepper to taste. Mound champ in a large bowl and hollow out the center for the butter allowing it to melt into the potatoes before serving.